Oh Missy. What have you done? I’ve spent my life marching to the beat of my own drum and ignoring the advice and opinion of others, until now. But my friend Missy has taken a strong interest in my garden design and for the first time in my life, I care. My garden has a plan. Every garden I’ve ever designed had a plan. Not just any plan, mind you, but every plant, every color and tint, every placement, and every view. Landscape design is like music to me. It plays in my head non-stop. Every single note must be in harmony, the rhythm and the bass perfectly consistent throughout; there can be only one lead singer and only one ad-lib solo. Every performer should be at the correct volume. It’s what gives a landscape unity. Have you ever been in a room where each musician is playing a different song and a different rhythm in a different key? It creates ear disturbing dissonance—discordance, disharmony…a cacophony! 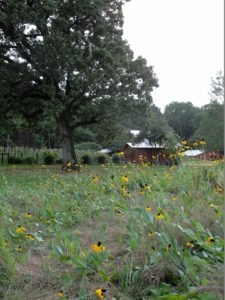 Many gardeners are perfectly fine just plopping their favorite plants and colors into their landscape, but not me. As they say, a place for everything and everything in its place. Missy loves yellow and isn’t a fan of pink these days. She thinks it’s time for a change in my landscape and she’s correct. 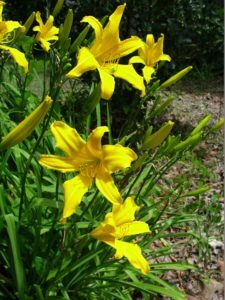 There are three primary reasons I’ve traditionally gardened sans yellow. 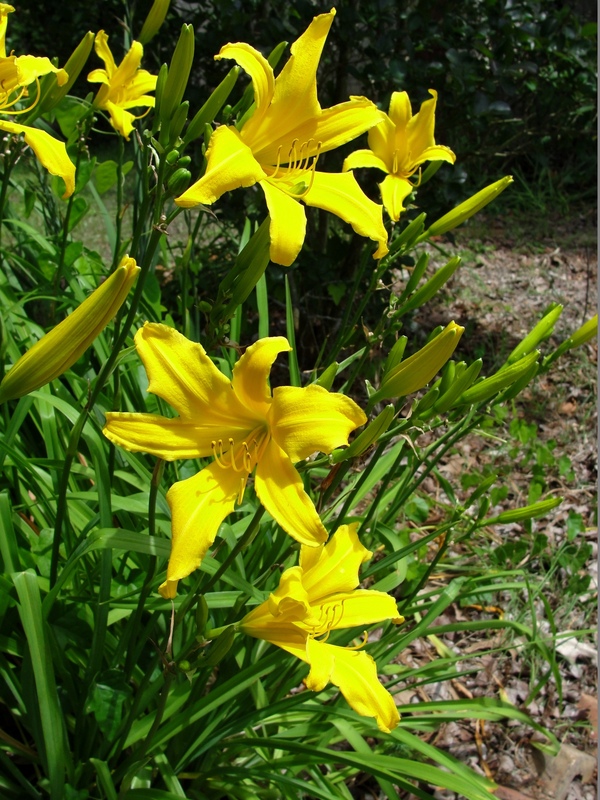 First, most of my property is festooned with golden yellow in February when my beloved jonquils and daffodils bloom. And I’ve long said that none other than a jonquil can do yellow justice, so I banished it from the garden until the following spring. Also, the main focal point of my entire landscape is a white ancestral dogtrot house set against a dark evergreen curtain of pines. 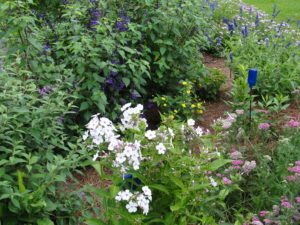 Therefore, my garden is primarily viewed against white, making deep, dark, rich colors resonate the most. Having lived in the sunny white limestone areas of Dallas and San Antonio taught me that. This is why my crapemyrtle allée is lilac-purple. The flowers around my house are literally color echoes, repeating the colors from my crapemyrtle lined drive. And finally, I’ve always been in love with shades of purple, magenta, and maroon. Why shouldn’t one swaddle themselves in their favorite colors? Missy suggested I add pockets of yellow to my perennial border and I’m taking her advice. She’s a fine gardener herself. The yellows will break up my purples and blues and help make the existing colors “pop.” So far, I’ve tucked several different yellow lantana cultivars into my border along with golden glow double rudbeckia and an heirloom yellow daylily that I divided from the old Johnson House up the road. But I’m not stopping there. As a surprise for Missy, I’m turning my entire front garden into an “ode to yellow.” I’m in the process of installing a monochromatic yellow Texas Superstar garden in front. Goodbye pink. Hello yellow! I’ve never been afraid of changing my garden. Heck, I’ve had a multitude of themes and designs in front of my house; at least half a dozen or more. As you may remember, I’m working on an Aggie lace poppy so I was in the process of removing my pink themed perennial planting. The cool season annual poppies need bare dirt to germinate each fall, so I was already planning to go with an annual summer change-out. I do miss designing and having something different each year. I especially miss my Rainbow Border from the 1990’s because it let me play with all the colors at once, in a giant linear color wheel. Changing out my garden is difficult since it all must be done on the weekends. 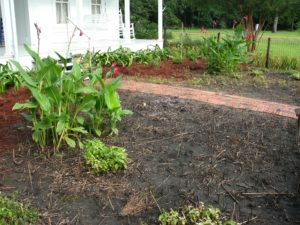 And killing Texas tough plants like Turk’s cap, perennial phlox, and rose mallow hibiscus is no easy chore. So far, I’ve burned, applied herbicide, dug, and raked and still don’t have the old display subdued. Missy (AKA Scarlett O’Hara) says it now looks like Tara after the war! I assured her a yellow blinding landscape was on its way, but unfortunately for a do-it-yourselfer, this is what it must look like for now. 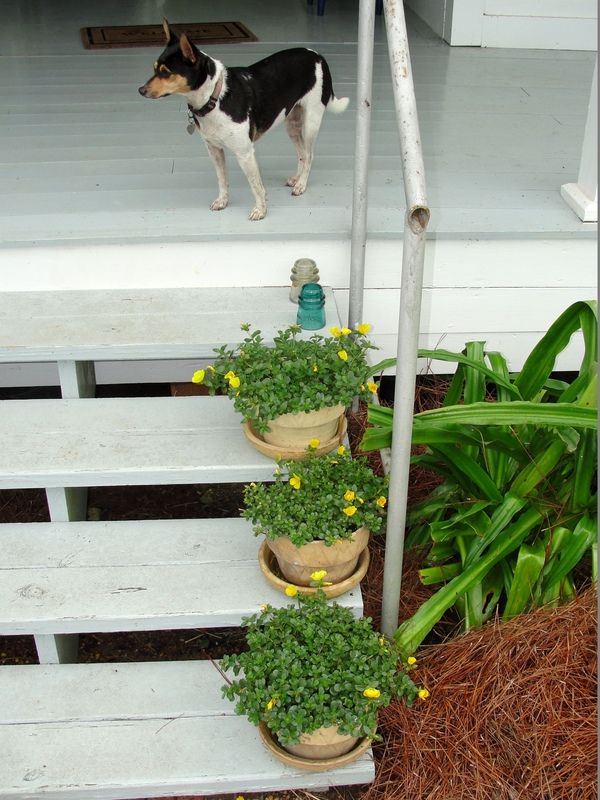 First, I put yellow purslane into antique pots on the front steps. The new Texas Superstar planting in front of the house will feature Gold Star esperanzas in the back corners, golden yellow thryallis sweeping through the middles, and drifts of New Gold lantana in front. All three have been designated Texas Superstars by Texas A&M AgriLife Extension for superior performance in Texas. After I manage to get my ‘Ehemanii’ canna clumps dug, each side will be punctuated with bold clumps of variegated tapioca, another Texas Superstar. 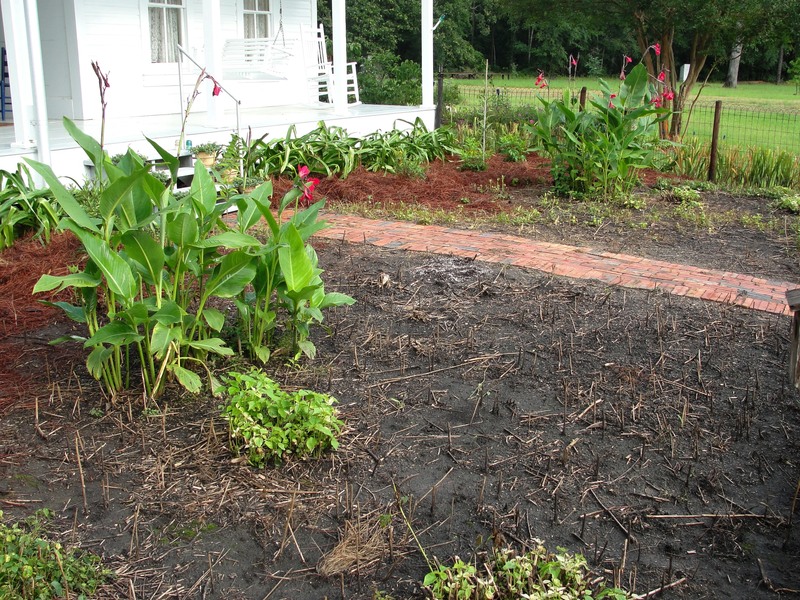 The pink stems will tie the planting into my existing pink crinums and pink crapemyrtles nearby. I love yellow. It is a bright and cheery color. Could you be in a better state of mind these days? 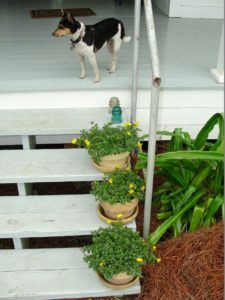 Since I live in the city with a city sized yard, I like the newer Lantana that is called Bandana or Bandito or Lucky. It grows smaller and keeps a rounded shape to about 12-18 inches. Some city gardeners may want to try it. Wonderful article! He writes from the music of his soul!